Here I address, one after the other and in good order, each of the 5 failings of paleo, according to Darrin Carlson (blogpost published a few days ago in Free the animal). First, the argument as it is described by Darrin Carlson is ambiguous. Is it an epistemological/psychological problem ? or an ontological problem ? Is it a problem with the way we build our knowledge (the way we obtain our data, analyse it and interpret it) ? Or is it a problem with the data (not representative, damaged by the time, incomplete, etc) ? Whatever it is, we can address it. If it’s an psychological/epistemological problem, Darrin’s statement is that we do not have the adequate tools to know with 100% certainty what we ate during the Paleolithic period. If he uses the 100% certainty with a psychological undertone, it means that certainty is a property of belief where the subject thinks that his/her belief is not amendable or is incorrigible. But we’re dealing with scientific truth, not about opinions. Is not science about being able to find counter-evidence, counter-argument ? With 100% certainty, science disappears, enters the dogma era. Do we want paleofitness and diet to be ruled by dogma ? As far as I’m concerned, I know what my answer is. If he uses the 100% certainty in an epistemic way, it means that the belief possesses the highest epistemic status. There are several definitions for this approach : indubitability, no mistake being possible, justification to the highest degree. The first two are psychological, so they fall upon my precedent remark. The problem with this approach is that it is very restrictive. Only some mathematical truths, that we know we can exhibit each section of the demonstration, pertain to that category where every part of a theory is known to be true. But paleoantropology does not demonstrate anything. It goes like any experimental science, from hypotheses to confrontation of hypotheses to evidence and data. Thus, there could no more than corrobated hypotheses. We are dealing with defeasible theories (under better interpretations or precedently unheard of data), not with mathematical demonstrations. In other words, it’s not a failing because it’s never been its aim to produce 100% certainty. We just can’t expect to find 100% justified truths from paleoantropology because it’s not its goal and it’s not in its power. 100% epistemic certainty is simply not relevant. If it’s an ontological problem, Darrin’s statement is that we do not possess the adequate and complete picture of what our paleolitic ancestors ate : our findings are too small, damaged, etc. Indeed, we don’t know if we have the whole picture. But more than that, we don’t know if we don’t. An agnostic posture is maybe healthier. Caution is the keyword in paleoanthropology : make no more assumption that what can be obtained from interpretation of accessible data, but no less. What we think we know is reliable, because it’s grounded on very carefully analyzed data ; but for the other part, we really don’t know and won’t venture on that highly slipperey ground. What I mean is that we don’t know if we have a good picture, but each piece of the puzzle we have is quite good. Second, the section of the argument when Darrin states that we don’t have compelling enough data on paleoanthropology to advice people to go paleo, may be flawed. The problem, according to Darrin, arises when we try to apply paleoantropology’s knowledge about our ancestors to build a contemporary scientifically justified paleo diet. It’s the classical Hume’s problem. We cannot go from « that’s the way it is/it was », « that’s the way we ought to do it ». It’s true, we can’t. It’s an unlogical leap of faith. But why would we want to derived logically the paleo diet from paleoantropology ? I think we have to consider what exactly are the relationship between paleoanthropology and the paleo diet. Is paleo diet derived from paleoanthropology, like electronic and computing technology are derived from first order logic ? or, like quantum optics are derived from quantum mechanic ? No it’s not. Why ? Because paleoanthropology’s ability to make prediction is limited by its topic : what happened a long time ago and had disappeared. A paleoanthropology expert can make predictions about features of humanity in the past, not in the present or future. The laws of paleoanthropology have a very precise range. Quantum physics is about what was, what is, and what will be. Logic is about what is sound according to a certain system of formal derivational rules and axioms, whatever are the other conditions. A quantum optics expert will use general laws, relevant for many and many conditions, to make predictions and explains aspects of optics. She/he will consider objects of optics to be in the range of the general laws formulated by quantum mechanics. The same goes for an electronic expert. Is it the case in paleoanthropology ? Are paleoanthropological law’s structure sufficiently abstract to consider that nowadays humans fall in its domain ? On what ground ? I think a paleoanthropology expert is only able to make prediction about the past of humanity, about what we were 3 millions years to 10 000 years ago. Biologically (the interbreeding criterion), we didnt change much, but from a evolutionary point of view (divergence of some members increased by isolation from the main population), we did change a lot. Thus the problem is not that we don’t know enough about our ancestors, but that it cannot tell us what we are now and what we should do. It’s simply not relevant, we are out of range in some way. 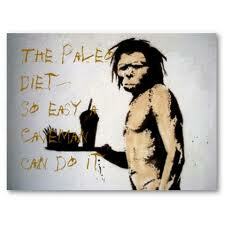 A paleo diet is not an application of laws about the past human nature to nowadays human. It’s a diet grounded on, among other things, paleoanthropology, which means that a paleo diet borrows results of researches about what was humanity to offer arguments and evidences in its favor. A paleo diet expert is like judge who uses paleoanthropology researches (among others) to ground his decision. Conclusion : it’s not paleoanthropology’s purpose to tell us what we should do, but it can help us to ground our decision to go paleo. So no failing, but maybe a disappointment for those who expect paleoanthropology to be the new Bible. Concerning relativism and the Paleo diet (failing 2 : there is a plurality of paleo diet, therefore there is no One paleo diet). First, formally, the argument is flawed. You cannot entail from the fact that there is several paleo diet, that none of them is better than the others. It’s like saying that there are many recipes in this world, consequently all of them must share the same gastronomic properties. Indeed, it’s conceivable that among the numerous variant of paleo diet, one (or some are) is better than others. We cannot exclude this possibility simply because the criterion to identify this better diet isn’t currently clear. The relativist argument doesn’t hold. Second, of course, there is no ONE paleo diet, because there is no paleolithic diet, but only a paleolithic lifestyle, the way humans exploited their environment with specific tools and technology and interacted with each others. It’s a form of life where exploitation of any environment is made by specific tools and technology. Nothing else. Yet environment ressources differ enormously one to another, this is why the resulting diets are not unified (even if the same technology was applied in each context). The result were different if you were in Ethiopia or if you had migrated to Denmark or Australia. But does that mean that each resulting diet was equally adequate for the metabolism of the humans exploiting the ressources of different environment ? It’s very far stretched conclusion. I wouldn’t go that far, because they may have mutated to adapt to new environment constraints. On the other hand, we know (studies show) that differences in diet have impact on health. So it seems to me that it’s highly probable that some paleo diet are better than others, even if the question of identification is still without clear answer. Conclusion : there is no magic diet for humans, but some are probably better than others. Concerning the speed of human evolution (failing 3 : we have evolved since the paleolithic, thus we can incorporate neolithic food in our diet). Indeed, we did evolve and still are. But that’s not the point of John Hawks’ study. First, we have to distinguish between mutation (a change in a genome) and selection (a nonrandom process by which a biological trait is fixed and dominant in a population), and its link to growth of population : the whole point of his study is that there is a correlation between the growth of the population and the rate of mutations. And the higher the rate of mutation, the higher is the probability to find adaptive mutations in a new environment. But growth of population isn’t a selection tool. Thus the fact that we mutate a lot doesn’t necessarily imply that adaptive mutations are already fixed (dominant) in our species. Second, there is the constraint of selection/mutation exclusivity to consider : the more selection you have, the less mutation you can have (when the members of species reach the optimum adaptation to their environment, then the space for mutation diminishes). Thus, with a new environment (opening of Neolithic era), and the sudden growth of population, we can assume the gross rate of mutations in human species has increased, and that it is highly probable adaptive mutations were selected. The study shows a huge increase in mutations, which means that the human body wasn’t at all ready for this kind of new lifestyle, because it was optimally adapted to paleolithic lifestyle and environment. The room left to mutations was very narrow at this point. We have to bear in mind that, even if our mutations rate is 100 times higher than during the paleolithic period, Hawk’s study’s range, is millions of year. The neolithic revolution began only 10 000 years ago, which means that we may not have finished adapting to the neolithic revolution, which happened not a long time ago, because it’s too short a time i) to produce several pools of populations across the world who offer the adaptive mutations ; ii) to make this adaptive mutation the dominant trait. And I’m not even talking about our modern, industrialized diet (there is no point to kid ourselves, what we eat today, even if we are careful, are domesticated species of wild plants and animals. Even if you own your farm, you raise cattle, not aurochs. The same goes for grains, legumes and dairy). Modern industrialized and processed food appeared only a few decades ago, even if we are adaptating very fast, we are outmatched. Maybe a few of us have mutated, but the advantageous genes cannot be dominant at this hour. Third, maybe some pools of human populations have evolved to adapt to a neolithic lifestyle and diet. By this I mean that adaptation to the neolithic lifestyle is or in phase of being dominant in certain human populations. Darrin is cautious in this paragraphe, when he writes that, depending on our ethnic roots, some of us may have adapted to live the neolitic way. But we don’t know who. What we do know is that real-life persons’ health is at stake. And I think it’s highly ethically dubious to encourage people to play with their health, just because of the intuitive idea they have about their ethnic roots. Conclusion : we all evolved to live the paleolithic way (with variant according to the difference in the environment), some (who ?) of us have also evolved to live the neolithic way, a fistful of us may have also mutated to live the industrialized way. First, failure 4 mixes « naturalistic fallacy » (an expression coined my the philosopher G. M. Moore to discuss a metaphysic argument in ethic) and « appeal to nature » (a way to use nature in the premises in an informal argument). The purpose of Moore’s argument is to show that there is no clear definition of the term « good », and that it cannot be reduce to the of sensation of pleasantness (see Principia Ethica, §10sq). The purpose of the appeal to nature’s argument is to justify a idea, a value, a behaviour, by an appeal to nature ; or to criticize an idea, value or behaviour by its « unnaturality ». An appeal to nature falls under the fallacy of relevance, as it is described by Darrin. Second, I don’t see the point of this tour de passe-passe, this rhetorical move. Expressions that can entail another expression necessarily salva veritate are really rare, philosophers doubt they are any. But the problem with Darrin’s statement is that it leads us to a dead-end, then leaves us here with no answer concerning the problem of the relation between paleo and nature. Why it is so that processed food aren’t inherently unhealthy or healthy to us ? that neolithic food aren’t inherently unhealthy or healthy to us ? Simply because what is healthy/unhealthy is determined by the cost/benefits relation in an environment/organism interaction. For me, Darrin is tackling the problem from the wrong side : it’s not « Paleo is natural, thus we have to go paleo », which is, as Darrin pointed it, a fallacy ; it’s « Nature was and is still in some ways paleo, thus we can go paleo ». And by nature, I mean the way humans interacted with a precise of state of environment. Paleo was and is partially still a state of nature, but nature isn’t a state of paleo, that is why you cannot entail that something is good because it’s paleo, or not good because it’s not paleo. Third, the argument is flawed. It states that, because of the fallacy of the appeal to nature, we cannot say that neolithic and industrialized food are inherently healthy/unhealthy. We cannot tell that they are inherently healthy/unhealthy for the reason I exposed before. But I think we do can tell whether they are healthy or not relatively to our organism, because we don’t always need an appeal to evolution to know that something is good/bad for us. Darrin’s argument is a kind of strawman : it assumes that in some way, hypothetically, there exists a knowledge of the absolute quality of food, then refutes it. OK. But, in what way does it concern us ? Do we need this type of knowledge ? If we are talking about our health, we are talking about the health of members of the human species at some point in history. Dietary knowledge about health is always a relation between the ingerable things and a metabolism in a certain state. Conclusion : don’t make a strawman to make up false failing of paleo, find the true weaknesses and address them. I totally agree with Darrin concerning the fact that we should use a cross-disciplinary approach when it comes to build our diet, because some inadequacies may be corrected that way. What I don’t agree with is his « condemnation » of nutritionism, then its generalization to science. I’m not opposed to the idea that we can balance sciences’ suggestions by using our own personal experience, but I find Darrin's use of science to back up some of his remarks (as in the extract), then his critic of science, and finally his advice that sometimes we have to trust science and sometimes we don't, without really without really telling us when we should and when we shouldn’t use science, a very disturbing moove. I don’t see any failure in that, except Darrin’s failure to exhibit his criterion to chose between useful and wacky science. Nutritionism is young, consequently we cannot trust it ? What kind of argument is this ? It has to be stronger than this. Imagine the consequences of this argument in other contexts ! If nutrionism is scientific, it must answer to the standards of scientific and experimental research, which prevent the « finding » of unsound results. If we have to select between useful and wacky science, we need a good and clear criterion. Philosophers have debated for hundreds years about this and cannot find a satisfactory criterion. Darrin leaves us with our intuition. But intuition and observation of intution have to be trained. What about for those who didn’t train ? And sometimes trained intuition fails us. No, we need a collective, shared criterion for that. Our intuition needs to be balanced. And it’s not paleo’s role to tell us when science is whacky or sound. Conclusion : some bad news : i) Paleo is not God, it cannot make a wacky theory into good science. But we already knew that ; ii) we don’t know yet how to distinguish good from bad science, but thankfully the standards for sound science are more and more selective and reliable, thus science can partially guide us in our choices. Paleo is a lifestyle, not a diet. We can’t strictly eat paleo for a lot of reasons, we can only emulate it. But the diet is not the whole point of paleo, it’s about being adapted to our environment, whether be it social, physical or metaphysical. And it’s different than eating more steacks in a week. Paleo is about building ethically, morally, physically fit and balanced individual, not following gurus. It’s good to follow advices of people more advanced than us in that path. But if it goes against your ability to personally build your life, drop it. Follow trainers times to times, but take yourself in charge all the time. More and more gurus will come in that area, so beware. Paleo is about finding happiness, not burdened yourself with constraints or punished yourself for what you think are past errors. Paleo can change your life, this change can be powerful, but you have make peace with what you are and what you did. Don’t let the comparison between your current paleo state crushes what you think you were, I’m sure you did great things. Paleo is about finding what (I’m not saying who, that’s a whole other thing) we are as a species and as an individual, not about erudition. Paleo is an interesting topic and it’s good to study the past and present of our species. But Paleo is a tool, and only a tool. If the tool becomes more important than the task itself, it’s time to get some perspective. It's one of the most powerful TedTalk I have ever seen. It's not about barefoot running or walking. But it's about listen to the skills of people ignored by others and about what matters. (Sorry I'm vague, but I don't want to spoil the whole thing). It's only 19mn long, and Bunker Roy is an amazing speaker. Les gens cherchent à se protéger parce qu'ils sont effrayés. C'est justement la peur qui est la racine du problème. Généralement nous connaissons seulement la peur du point de vue de la victime potentielle. Mais la peur existe aussi de l'autre coté, l'agresseur est également effrayé. A présent vous êtes sceptique et je vais vous donner trois scénarios. Un voleur veut votre montre. 1- Si vous êtes assoupi, il se faufilera, la dérobera et partira. Vous ne le sentirez même pas. 2 -Si vous êtes malade ou saoul, il pourra proposer de vous aider et prendre la montre à votre poignet ou bien l'arracher et vous pousser à terre. 3 -Si vous marchez dans la rue droit en pleine santé, c'est à peu près sur qu'il vous blessera. Il pourra vous sauter dessus agressivement, sortir une arme et si vous donnez pas votre montre, vous finirez blessé ou mort. D'où provient l'acte d'agression du cas de figure ? De la peur qu'il n'arrivera pas à ses fins, que vous puissiez le blesser, le contenir jusqu'à l'arrivée de la police ou même le tuer. L'agression découle de la peur. [...] La source de ce besoin destructeur peut aussi être la peur ressentie par l'agresseur. Un prédateur (j'exclue les cas d'agression dans le cadre de l'établissement d'une hiérarchie sociale) est un individu rationnel: le but de l'agression est d'obtenir ce qu'il veut de manière rentable: maximum de dégâts pour l'agressé et minimum de dégâts pour lui. Et c'est la peur que la prédation se retourne contre lui qui entraîne l'agresseur à choisir le moment où l'agressé potentiel est le plus vulnérable. L'art martial russe devrait être le choix des dames pour plusieurs raisons. -Les traits uniques du Systema, tels que les mouvements naturels et la prise de conscience de ses propres forces et faiblesses permettent aux femmes de s'adapter rapidement même si elles sont complétement étrangères au combat. -Les femmes peuvent progresser comme les hommes, elles progressent souvent plus rapidement que la plupart des hommes. -Étant souvent plus menues et plus faibles physiquement que les hommes, les femmes vont trouver les principes de non-résistance et d'immersion dans le mouvement très naturel, alors que les hommes auront plus de difficultés avec cet aspect. -Utiliser l'inertie pour manipuler le corps de l'adversaire n'est pas difficile pour les femmes. C'est le seul moyen pour qu'elles puissent travailler avec un grand gabarit. -Une plus grande mobilité naturelle des tendons, la flexibilité et des mouvements gracieux sont des des avantages en Systema. Le Systema joue à la fois la carte de la psychologie (on fait face à ses propres peurs et aux limites de notre système moral: tomber, prendre un coup, faire mal à quelqu'un, la panique, etc) et la carte de l'entraînement physique. Les hommes sont souvent pris au jeu de la force. Les rites d'établissement de hiérarchie sociale, fondés sur la force (comme la monkey dance) sont très ancrés chez les hommes. C'est pourquoi, en cas d'agression ou de prédation, ils ont tendance à utiliser la force. Or, le prédateur a de nombreux avantages: il a choisi un environnement qui rend l'agressé vulnérable, il aura sans doute prévu une arme, avant même que l'agressé comprenne qu'il est une victime l'agresseur l'a déjà sans doute atteint plusieurs fois, etc. Un individu déjà atteint, vulnérabilisé, ne peut plus compter sur la force pour s'en sortir. Les premiers obstacles sont psychologiques : la panique (argh! j'ai été touché malgré mes 10 ans d'entraînements en karaté! ), l'acceptation de prendre des coups, la volonté de croire qu'on va s'en sortir. Femmes et hommes sont concernés. Et ce n'est pas la force physique qui permet de dépasser ce genre d'obstacles. Version française de: persistence hunting and a hypothesis about human evolution. Ce documentaire est une partie de The Life of Mammals (2002), un film réalisé par David Attenborough, et produit par la BBC et Discovery Channel. Quand j'ai vu ce documentaire pour la première fois, certaines émotions et idées liées à la course à pied, qui étaient jusqu'alors assez confuses, sont devenues claires et pleines de significations. Je savais déjà que la chasse à l'épuisement existait, entre autres grâce à la lecture du livre de Christopher McDougall Born to run et du livre de Bernd Heinrich Why we run, mais le fait de le voir a changé quelque chose. Je pense que mon lecteur a vu Avatar, de James Cameron. Vous souvenez-vous du moment où Jake Sully vole pour la première fois avec son ikran/banshee ? Il dit : "I was born to do this (J'étais né pour ça.)." C'est exactement ce que je ressens. Je me sens né pour le faire. D'un point de vue plus objectif, tout le monde peut observer qu'on est fait pour courir, que nous avons hérité de dispositions innées liées à la course à pied: des jambes longues, des genoux pour absorber les chocs, un talon pour stabiliser le mouvement, un coeur capable de changer de rythme en fonction de l'effort... Si nous avons toutes ces dispositions, c'est pour une bonne raison. C'est un outil de survie. Personne d'autre ne court comme nous courons, et c'est précisément ce qui nous donne un avantage dans certaines conditions. Cette vidéo m'a permis d'expliquer certains comportements quand je cours. Par exemple, j'aime être silencieux quand je cours, si silencieux que même un chien ne m'entend qu'au dernier moment, qu'au moment où je suis si proche de lui que je pourrais le prendre avec mes mains nues. Cela m'a permis aussi de rendre plus clair certaines expériences plus ou moins religieuses liées à la course. Dans la vidéo, le chasseur se met en transe pour atteindre l'esprit du koudou, se mettre à sa place, et retrouver sa trace. C'est typiquement une expérience religieuse de sortie de l'âme du corps. Cela m'a permis de comprendre aussi pourquoi je n'aime pas tout ce qui peut interférer avec mon attention quand je cours, comme la musique. Courir, c'est être en interaction avec son environnement. Les nerfs sensori-moteurs sous les pieds captent des informations sur la nature du terrain et les transmettent, en retour, le système nerveux central renvoie des commandes pour adapter le comportement du coureur. C'est une interaction un aller-retour incessant entre le sol et nous-mêmes, via nos pieds. Pourquoi voudrais-je interférer avec cette harmonie ? J'ai aussi compris la loi fondamentale de l'alimentation du coureur: il ne faut pas manger quelque chose avant de courir. Être à jeun est l'état naturel de notre corps, il sait le gérer (même si cette capacité se perd dans la société de surabondance qui est la nôtre). Un chasseur (quand son territoire n'est pas confisqué par des trafiquants ou des États non moins criminels) court non pas parce qu'il a un surplein de ressource énergétique à évacuer ou parce qu'il ne désire rien d'autre que les effets bénéfiques de la course à pied, mais pour manger quelque chose. Après avoir couru arrive le festin. Quand nous jeûnons, nous utilisons les lipides comme ressource énergétique. C'est ce pour quoi nous sommes faits. Se gaver de glucides avant un effort, c'est une erreur. Qu'est-ce que la chasse à l'épuisement ? La chasse à l'épuisement est une technique de chasse identifiée seulement chez les humains. Il s'agit de la manière la plus ancienne connue d'obtenir un gibier. Il semblerait que les hominidés la pratiquent depuis environ 2 millions d'années. Nous n'avons été qu'occasionnellement des charognards (occasionnellement parce que les autres charognards étaient avantagés par des dispositions de défense/attaque supérieures aux nôtres). Nous n'avons utilisé des armes que très tardivement (la lance est apparue il y a environ 400 000 ans et l'arc 30 000), et de toute façon, elles étaient au départ trop imprécises pour être utilisables en situation de chasse. C'est pourquoi nous avons pratiqué la chasse à l'épuisement. Cette technique est une combinaison de course à pied et de traque. La traque servait d'une part à ne pas perdre de vue la proie, mais aussi à l'isoler du groupe auquel elle appartient. La course permettait évidemment de se rapprocher de la proie qui s'enfuyait, mais surtout de l'épuiser. C'est ce qui fait le coeur de la chasse à l'épuisement: on court jusqu'à ce que la bête meurt d'épuisement. Cette disposition est spécifiquement humaine. Si vous avez regardé la vidéo, vous avez remarqué que c'est un exploit à la fois physique et mental. La dimension physique est dans la poursuite, dans l'utilisation de ses mains libres pour transporter de l'eau et dans l'avantage résultat de notre système si particulier de thermorégulation: la transpiration. Mais il s'agit aussi d'un exploit mental : le chasseur brise la volonté de vivre de l'animal. Comment chasser et pourquoi peut-on pratiquer la chasse à l'épuisement ? Il n'existe pas de manuel pour la chasse à l'épuisement et ce savoir est quasi inaccessible. Certains chercheurs et coureurs contemporains forcenés ont tenté d'en faire l'expérience en utilisant le peu de connaissances dont ils disposaient. Voici quelques témoignages : Fair Chase, Persistence hunting part one, part two, part three, part four par John Durant. Il y a aussi quelques descriptions dans le livre de Christopher McDougall, Born to Run, de Scott Carrier, Running after the antelope (une version audio de son expérience peut être écoutée ici) et dans le livre de Heinrich, Why we run (pp. 128-132). Pourquoi réussisons-nous à épuiser un animal à un tel point qu'il en meurt ? Notre premier avantage est la transpiration. La transpiration est la production d'un fluide composé en grande partie d'eau, de minéraux et d'urée. Ce fluide est exécré par des glandes situées sous la peau. Chez l'espèce humaine, la transpiration sert à réguler la température: au fur et à mesure que l'eau s'évapore, la peau est refroidie. Les autres espèces régulent leur température en utilisant les glandes qui se trouvent dans la bouche en halètant. L'eau qui se trouve dans la cavité orale s'évapore, ce qui entraîne une diminution de la température du corps. Nous pouvons chasser jusqu'à l'épuisement total d'un animal, parce qu'en courant, nous obligeons un animal à constamment augmenter sa température, tout en réduisant son temps de récupération. Au bout d'un certain, sa thermorégulation n'est plus à la hauteur de l'effort. Il meurt d'un coup de chaleur interne. Une remarque pour terminer sur ce point. Beaucoup de personnes ne sont pas à l'aise avec l'idée de la transpiration. Je voudrais leur dire qu'il n'y a pas de raison d'en avoir honte, précisément parce que c'est ce qui nous donne un avantage incomparable. Certaines études montrent en effet (c'est une hypothèse parmi d'autres) que la raison pour laquelle nous avons survécu au réchauffement de la planète il y a 50 000 ans et aux conditions difficiles de la vie sauvage, contrairement aux autres espèces humaines qui existaient alors (comme l'homo neandertalis), c'est notre système de régulation de la température interne. Dans une compétition de chasse à l'épuisement, un homo sapiens aurait une proie beaucoup plus rapidement que son concurrent l'homo neandertalis. Notre deuxième avantage est la bipédie. Les quadrupèdes peuvent se déplacer plus rapidement que nous sur une distance courte. Mais nous avons l'avantage d'avoir des mains libres, ce qui nous permet de transporter des choses. Par exemple, nous pouvons transporter de l'eau, ce qui nous permet de ne pas nous déshydrater complètement. Les autres animaux se déshydratent et ne peuvent lutter contre cette tendance en situation de chasse. Nous pouvons en revanche la stopper. Un autre avantage est le rythme de notre course à pied. Voir (Bramble & Lieberman 2004). Ils ont comparé la distance parcourue par seconde en fonction des types d'allures pour des animaux <500kg (chevaux), des humains, et des quadrupèdes >65kg. Les chevaux sont très rapides quand ils galopent. Ils peuvent couvrir jusqu'à 11m par seconde, alors que les humains ne dépassent pas 10m ps. Mais il s'agit de la condition du sprint. Le point important est que les chevaux ne peuvent pas galoper très longtemps. Et quand ils ne galopent plus, ils trottent. Quand ils trottent, les chevaux parcourent jusqu'à 6m par seconde. Nous ne pouvons pas sprinter aussi rapidement que les chevaux, mais en revanche nous joggons plus rapidement qu'ils ne trottent. Nous parcourons 7m ps en joggant. Et nous pouvons tenir ce rythme pendant des heures (voir le graphique). Vous avez compris la tactique: un cheval chassé est effrayé, il galope et s'éloigne des chasseurs, puis, à cause de la fatigue, il trotte. Pendant ce temps, les chasseurs humains, distancés par le galop, reviennent à la hauteur du cheval. À ce moment-là, il regalope. Il s'arrête et reprend le trot, les humains reviennent à sa hauteur. Et cette action se répète jusqu'à ce que le cheval s'effondre parce que son état ne lui permet plus de galoper. Un autre point important du papier de Bramble et Lieberman: nous sommes plus rapides en jogging que les quadrupèdes >65kg (ce qui signifie que les hominidés non entièrement bipèdes n'ont probablement pas pratiqué la chasse à l'épuisement). Notre quatrième avantage est le fait que nous sommes une espèce socialement très développée. Réalisée seul, la chasse à l'épuisement est perdue d'avance. Comme l'écrit Scott Carrier, les animaux sont des proies professionnelles. Elles connaissent les règles du jeu. Elles vont lutter contre la volonté du chasseur de les isoler en allant au milieu du groupe pour ne plus pouvoir être reconnue, les emmener dans des environnements avec des obstacles, etc, pour que tous les efforts des chasseurs soient réduits à néant. C'est pourquoi un chasseur a besoin d'autres partenaires. Pour porter plus d'eau, pour répartir les tâches, pour soutenir le chasseur qui va accomplir la partie finale de la chasse (de 2 à 4 heures de course à pied, après tout la partie d'isolement). Le cinquième avantage est notre système respiratoire (Bramble & Carrier 1983). Avez-vous déjà observé un chat ou un lapin courir ? D'abord, les pattes antérieures touchent le sol, puis les postérieures. Pendant ce temps, le dos de l'animal est rond. À ce moment-là, les viscères remontent vers le diaphragme qui appuie sur les poumons. Ce qui provoque un rejet de l'air, forçant l'animal à exhaler. Ensuite, l'animal s'allonge après la poussée des pattes postérieures. Là, les viscères sont étirées, elles reviennent vers le bassin et la pression contre le diaphragme cesse. Un appel d'air dans les poumons arrive, l'inhalation commence. Plus le mouvement des entrailles est rapide, plus l'animal peut respirer rapidement. (voir Heinrich 2001, p. 98, 99, 111-119; McDougall 2009, pp. 214sq). Le mouvement ressemble au glissement de l'eau dans une baignoire. McDougall caractérise ce mouvement par "take-a-step, take-a-breath (un pas, une respiration)". Eh bien, cela ne correspond pas du tout à notre manière de respirer. Notre système respiratoire est déconnecté de notre foulée, nous pouvons faire plusieurs pas en inhalant et plusieurs pas en exhalant. L'avantage des autres animaux est qu'ils font une économie d'énergie: un seul mouvement suffit pour faire un pas et respirer. Mais parce que leur thermorégulation est articulée à leur respiration et à leur foulée, paradoxalement, plus ils ont chaud, plus ils doivent aller vite pour se refroidir... jusqu'à ce qu'ils arrivent à leur limite. Ce système ne leur permet pas de courir très longtemps. Aussi atteignent-ils leur limite très rapidement. À 40°, un guépard cesse de courir. Sinon, il meurt. Pour nous, aussi longtemps que nous pouvons transpirer, nous pouvons respirer. Grande abondance de glandes servant à la transpiration, et fonction thermorégulatrice de la transpiration. Des doigts de pied courts (les longs sont plus appropriés pour la marche) (voir Campbell et al 2008). Des muscles glutéaux très développés. La tendance des humains à participer à des événements running de longue distance comme les marathons et les ultramarathons. Capacité à stocker les lipides (et à les utiliser comme ressource énergétique). Difficultés à faire face à un régime de vie sédentaire (obésité, pathologies liées au diabète). Le ligament nuchal. Sa fonction consiste à stabiliser la tête quand un animal court. Les espèces animales qui courent (chevaux, chiens) ont ce ligament. Les espèces qui marchent, comme les chimpanzés, n'en ont pas. C'est un trait distinctif des espèces qui courent. Si vous vous êtes intéressé à l'évolution de la tête des humains, vous savez que sa taille a augmenté soudainement il y a environ 2 millions d'années. Cette implique deux choses: i) puisque le cerveau est un élément du corps extrêmement coûteux en énergie, alors cela signifie que les humains doivent avoir à disposition une ressource énergétique importante ; ii) certaines parties du cerveau sont peut-être plus développées (ce qui a peut-être pour conséquence une redistribution ou réorganisation des fonctions et de la structure) chez l'individu dont la taille du cerveau a augmenté par rapport aux parties du cerveau des individus de l'espèce dont ils dérivent et dont la taille du cerveau est inférieure. Il y a 2 millions d'années les hominidés appartenaient à l'australopithecus genus (qui est apparu 3 millions d'années plus tôt, c'est-à-dire il y a 5 millions d'années). Parmi les traits distinctifs de ce genre on trouve les traits suivants : puissantes et grandes mâchoires, taille du cerveau assez petite, intestins très longs. Pourquoi ? Pour digérer des plantes particulièrement fibreuses, qui lui fournissaient la ressource énergétique dont il avait besoin. Mais il y a 2 millions d'années, c'est le moment de la transition entre l'australopithecus genus et l'homo genus, via homo ergaster et homo erectus, les premiers hommes parmi les hominidés. Qu'est-ce qui les différencie ? Un cerveau plus gros, des intestins plus courts, des mâchoires assez petites avec des dents pour déchirer, une position debout. Pourquoi ? Parce qu'ils avaient trouvé une nouvelle ressource énergétique. Laquelle ? La viande fraîche. Elle est plus facile à digérer que les plantes (qui n'ont strictement rien à voir avec les variétés domestiquées que nous trouvons dans nos assiettes), et contient plus, par unité comparable, de ressource énergétique qu'une plante. Comment avons-nous obtenu cette viande fraîche ? Par la chasse à l'épuisement. Avec la chasse à l'épuisement les premiers hommes possédaient une ressource énergétique plus compacte pour combler les grands besoins du cerveau. (Liebenberg 1990), dans un geste audacieux, lie le sort de la chasse à l'épuisement à l'évolution de la culture moderne (art et science), mais puisque je n'ai pas lu ce livre, je ne vais pas m'aventurer dans ses hypothèses et ses conclusions. Remarquez tout de même que des études (Brower 2006; Leakey 1992, pp. 257-258) montrent que, contrairement aux membres de l'australopithecus genus, homo erectus et ses descendants les plus directs possèdent l'aire de Broca (région du cerveau requise pour la disposition du langage), et qu'une autre montre que les homines erectes furent les premiers à vivre en petite tribu d'une manière semblable aux chasseurs-cueilleurs modernes. Bramble, Dennis M., and Carrier, David R. (1983). Running and Breathing in Mammals. Science 219: 251-256. Bramble, Dennis M. & Lieberman, Daniel E. (2004). Endurance running and the evolution of Homo. Nature, 432: 345-353. Boehm, Christopher (1999). Hierarchy in the forest: the evolution of egalitarian behavior. Cambridge Mass. : Harvard University Press. Bower, Bruce (2006). "Evolutionary Back Story: Thoroughly Modern Spine Supported Human Ancestor". Science News Online 169 (15): 275. Campbell, Rolian, Lieberman, Daniel E., Hamill, Joseph, Scott, John W., Werbel, William (2009) Walking, running and the evolution of short toes in humans. The Journal of experimental biology, 212, 713-721 . Carrier, David, R.(1984). 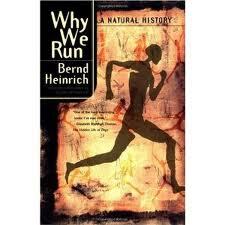 The energetic paradox of human running and hominid evolution. Current Anthropology, 25:4. Carrier, Scott (2001). Running after Antelope. Counterpoint Press. Heinrich, Bernd (2002). Why we run. A Natural History. New York: HarperCollins Publishers. Leakey, Richard (1992). Origins Reconsidered. New York: Anchor. Liebenberg, Louis 1990. The Art of Tracking: The Origin of Science. David Philip. Liebenberg, Louis (2006). Persistence Hunting by Modern Hunter-Gatherers. Current Anthropology, 47:6. Liebenberg, Louis (2008). The relevance of persistence hunting to human evolution. Journal of Human Evolution, 55: 1156-1159. McDougall, Christopher (2009). Born to Run: A Hidden Tribe, Superathletes, and the Greatest Race the World Has Never Seen. New York: Knopf. English version of Chasse à l'épuisement, running, & évolution de l'homme. This video is part of David Attenborough's The Life of Mammals (2002), a nature documentary produced by the BBC Natural History unit with Discovery Channel. When I first saw this documentary all sort of things came to my mind. I already knew that persistence hunting existed, thanks to Christopher McDougall's book Born to run and Bernd Heinrich's Why we run. But when I saw it, confused feelings and thoughts about running became focused. I don't just run. I don't go around a track, I go everywhere, I try to find obstacles (anything in my environment), I give myself an imaginary or actual goal, that has something to do with real-life situation: going somewhere, finding someone or something, etc. I can't run if I don't have a practical goal. Not a time, a heart rate, a distance, or an energy consumption, I care not about them. But I need to give myself something to do. The hunter doesn't run randomly, he has a purpose. I assume many of you have watched Avatar. Remember the moment where Jake Sully says that he felt he was borned to fly the banshees/ikran ? I get exactly the same feeling when I run. That I was born to do this. I feel right in place. In a less subjective note, some things about what we are as a species made sense. I knew that we were built to run: long legs, knees to absorbe shocks, heart's ability to change its rythm, etc. I knew that if we had those, it must have been for a good reason. But there was the answer: it's a survival tool. Nobody can run like us, that's what gives us an advantage. I remembered some playful tricks I usually do when I run, e.g., be silent while running, so silent even a dog can't hear me coming until I'm right behind him, so close I could catch him with my bare hands. The transe of the hunter reminds of mystical and religious feelings and thoughts while running (e.g., when running in harsh conditions, I can't help but thinking that I'm doing a Man versus Nature contest; or the sensation of floating, as it is described by Marshall Ulrich in Running on Empty; etc). I could understand my dislike of listening to music when I run or of anything that can cut me from my environment. Running is an interaction between your body and the world. Your nervous system gives information about the world through the nerves implantation in your feet, and your central system gives commands to your body to adapt to your environment. It's an harmony. Why would I want to interfere with that ? I need to be with myself when I run. I understood right to the point a fundamental law of nutrition and metabolic functions: you don't need to eat before running. Starving has been (and is still in some part of the world) the normal state of our metabolic system. Hunters ran and still run (when their territory isn't destroyed or confiscated by whatever criminal groups or States), because they need to eat, not because they had some superflous energy to spend or because they craved the health benefits of running. After running comes the feast. While fasting, we use fats as an energy source. That's what we were designed by natural evolution to do. We don't need to eat that much and certainly don't need sport drinks or a specific athlete diet. Even in harsh conditions, we can survive and be a lethal weapon. What is persistence hunting ? Persistence hunting is a human hunting technique. It's the oldest known to man way to get fresh meat. Hominids seem to do persistence hunt since 2 millions years. We weren't scavenger (well sometimes we were, but very occasionally) because we weren't the biggest cat in town. And weapons came very late (spears around 400 000 years ago; bow and arrow 30 000) and were too unaccurate to be really useful. So we did persistence hunt. It's a combination of running and tracking. Tracking allows the hunters to keep track of the prey and to isolate it from the group. Running is not only to get close to the prey, but to exhaust it. That's the whole point of persistence hunting: run an animal to death. We can do that, we're the only species on earth that can run an animal to death. If you have seen the video, it's a 50% mental and 50% physical prowess. The hunter uses his perspiration and free hands's advantage. That's the physical part. But it's also a mental game. The hunter breaks the will to live of the animal. How to hunt and why can we ? There is no persistence hunting manual. This knowledge is almost extinct. But some contemporary researchers and runners tried it. There are some online testimonies: Fair Chase, Persistence hunting part one, part two, part three, part four by John Durant. You can also find some description in Christopher McDougall's Born to Run, and Scott Carriers's Running after the antelope (an audio version of Carrier's book can be found here), Heinrich's Why we run (p. 128-132). So why can we run a animal to death ? As I said, first because we possess the finest thermoregulation on earth, second, because our hands are free, third, because we are fast on long distance, fourth because we are a social species, fifth because our respiration is disconnected from our running movements. Perspiration is the production of fluid that consists primarily of water and some chlorids. They are execreted by sweat glands in the skin of mammals. In the human species, perspiration is a thermoregulation system: as the water evaporate, the skin is cooled down. Other species thermoregulate using their glands in their mouth by panting. They evaporate the water in the oral cavity, which decreases the body temperature. So why can we run a animal to death? Because, in persistence hunting, we constantly increase his body temperature while reducing is recovery/panting time. At the end, his body cannot cope with the effort. They die of heatstroke. A lot of people are not comfortable with sweating during an effort. I would say to them that there is no reason to, because it's a matchless advantage. Some argue (it's an hypothesis amongst others) that the reason why we are alive and Homo neandertalis (a species, with strong, huge and highly sophisticated from a cultural viewpoint individuals) disappeared is that they could not cope with the global warming of Earth 50 000 years ago, because their thermoregulation system was not efficient enough. In an endurance running competition with Homo sapiens, we would run a lot faster than they were in long distance. We would get our prey long before they could. Our hands are free, contrary to quadrupedes, thus we can carry thing, like water. Quadrupeds are faster than we are on short distance, we have an advantage with the ability to carry things. With water, we can refresh, replenish our stock of body-water. We can run an animal to death, because other animals can't cover the loss of water, they drain water faster than they can replenish their stock. We can stop this depletion. We're fast on long distance thanks to our pace. 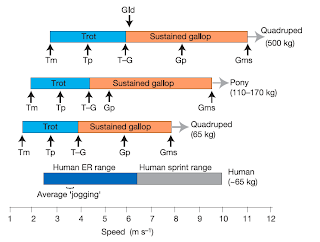 See (Bramble & Lieberman 2004) They compared the stride lengths of humans and horses (quadruped <500kg). Horses are really fast when they gallop. They can cover up to 11m per second, while humans can cover up to 10m per second in a sprint. But the point is that horses can't sustain over a long time speed gallop. When they can't gallop anymore, they trot. When they trot, they cover up to 6m per second. We can't run as fast as horses, but at an average jog, that we can sustain for hours, we can cover up to 7m per second (see the graphic from Bramble & Lieberman 2004). You see the tactics: the horse is frightened and run for his life for a few kilometers. We run not fast enough to stay at his level, but to keep him in sight and compell him to gallop regularly. Then, meters after meters, we get closer and closer until he is tired enough not to be able to gallop anymore. 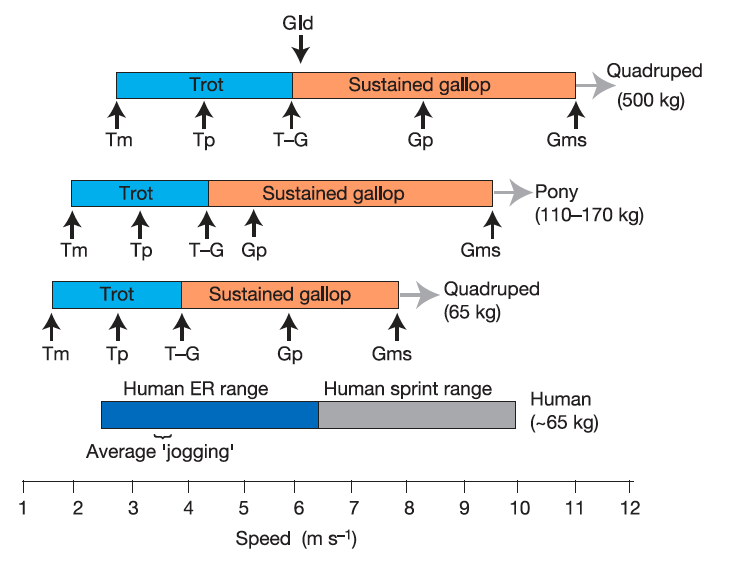 Another point on Bramble & Lieberman paper: we are faster than quadrupeds >65kg (e.g. chimpanzees) at this game. We're a social species. Alone, persistence hunting is a losing game. As Scott Carrier says it, animals are professional preys. They know their stuff. They will struggle against our will to isolate them, they will go in the middle of the tribe so that no one can recognize them, and that hunters' efforts are nothing but a waste of time and energy. That's why we need other humans. They will keep the prey isolated, carry some extra-water, etc, so that the runner can carry on his duty at the final point of the hunt (the last two or four hours of running). We can run an animal to death because we're an extra-organized species. Our breathing technique is different from other species (Bramble & Carrier 1983). Have you ever seen a rabbit or a cat running? First, they anterior legs touch the ground, then the posterior. While they're doing so, their back is round. At this point, the guts are pushing against their rib cage and lungs, forcing the air to go out, the animal to exhalate. Second, they elongate, the guts are stretched, pushed back against the pelvis and pressure against the lungs stops. At this point, a call for air is provoked and inhalation begins. The faster the movement of the guts, the faster they can breath. (See Heinrich 2001, p. 98, 99, 111-119; McDougall 2009, pp. 214-). As McDougall puts it, it's a "take-a-step, take-a-breath" coordination. Well it's not the case for us. Our breathing is disconnected from our stride. We can do several strides while inhaling. The whole point of other species breathing is that they save energy, their technique does not require a specific movement for breathing, as we do. But because they cool down by panting, their thermoregulation is entirely locked to their breathing system. It's more economic but less efficient. Indeed, if their temperature is skyrocketting during an effort, it means that for decreasing the temperature, they have to pant more. But to pant more, they have to run faster. But if they run faster, their temperature increases! Thus, it's less efficient than the functioning of our breathing/thermoregulation system. 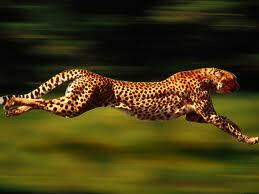 Once a cheetah reaches 40 degrees (celsius), it refuses to continue. The system shut down, it stops running. If not it dies. Well, for us, as long as we sweat, we can continue breathing at heart content. Hairlessness and an abundance of sweat glands, as a heat loss mechanism. Short toes. (See Campbell et al 2008). Long legs with springy tendons (no tendons in walking species, like chimpanzees). The nuchal ligament. This ligament is used to stabilize the head when an animal is running fast. It's attached to the posterior tubercule of the atlas and to the spinous processes of the cervical vertebrae. Dogs and horses got this one. Walking species, like chimpanzees, don't. This ligament typically identifes a species as a running one (thus, not a walking species). If you study the evolution of the brain of hominids, you know that the size of the brain increased suddenly 2 millions years ago. An increase means that i) the individual with an increased brain size has to find new supplies to provide energy resources (because the brain requires high amount of energy); ii) some aeras of the brain are more developped in this individual (requiring perhaps a reorganisation of the brain) than in the brain of the members of the species from which it derives. 2 millions years ago, the hominids pertained to the australopithecus genus (who appears 3 millions years before, i.e., 5 millions years ago). His features were, among others, giant jaws, tiny brain, and very long intestines. What for? To digest fibrous plants. But 2 millions years ago, it's the transition between australopithecus genus and homo genus, via homo ergaster and homo erectus. What happened? Their intestines were shorter, they standed up, they had tearing teeth, and their brain became bigger. Why? Because they found a new energy source. Which one? Fresh meat. It's easier and faster to digest, and per unit, it contains more energy resources than plants (which differed strongly from the domestic species we know). How did we get fresh meat? Persistence hunting. With persistence hunting, we could supply more energy resource to feed our brain. And the benefits were increased sophistication of our mind. (Liebenberg 1990) boldly ties up hunting and the evolution of modern culture, e.g. science and art, but I never actually read it. So I won't venture any statements on that subject. However, a study (Brower 2006; Leakey 1992, pp. 257-258) shows that, contrary to members of australophitecus genus, homo erectus and his most direct descendants possessed the Broca's area (region of the brain required for sophisticated and articulated language ability) and another (Boehm 1999) that they were the first to live in small band societies similar to modern hunter-gatherer groups .